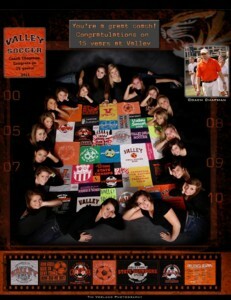 Coach Chapman’s 2010 Championship team is pictured in this poster photographed and designed by Tim Vorland Photography. Late in 2009, we looked into making a t-shirt quilt for our daughter’s high school soccer coach. He was the first girls soccer coach at the high school, had been there 15 years, and coached 6 teams to become State Champions! It had to be special. Secretly, with Coach Chapman’s wife; soccer moms from years past; current, and past players; we were able to get a huge variety of shirts. We ended up with about 40 shirts. We had something from all 15 years and each of the 6 State Championship shirts! Coach Chapman was truly surprised at the spring banquet and just loved his t shirt quilt. Since then we have made vacation t shirt quilts, runner’s t-shirt quilts, sorority t shirt quilts, memory t shirt quilts, and family reunion quilts from many so many different states. Pictured in our photo gallery are marching band, swimming, soccer, baseball, track, football, Army, hockey, cheerleading, college, high school, Olympic, dance, and Harry Potter t-shirts. They have been for girls, boys, men and women. Campus T Shirt Quilts are a great gift at graduation, or anytime really. Many of our customers actually get very emotional when they get their finished quilt! We make fabulous t shirt quilts from YOUR t- shirts! We are experts at making a perfectly designed t shirt quilt. Since 2009, our quilts have been sewn together with care and designed to be a great mosaic or memory t-shirt quilt for you to keep forever. More about us.